Say hello to the new 2018 Toyota Corolla at your Ontario, OR Toyota dealer. 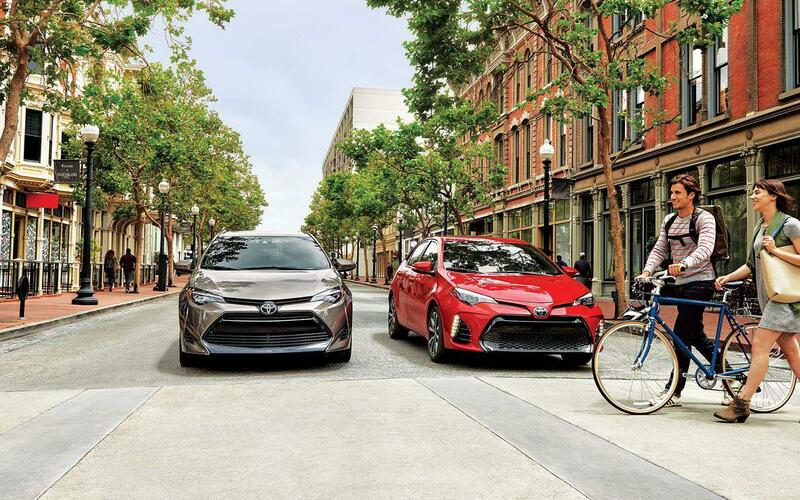 The 2018 Toyota Corolla sedan builds on the success of its ancestors with expressive styling, a roomy cabin, added advanced safety features and comfortable, supportive seats. The 2018 Toyota Corolla for sale in Ontario makes extensive use of its unibody and high tensile-strength steel to provide expressive styling in the latest edition of this popular Toyota sedan. With a modern, streamlined, high-class look, the new Corolla even offers more aerodynamic energy than before. Along with a stylish exterior, the newest Corolla model also offers a roomier and more comfortable than ever. Thanks to its 41.4 inches of rear seat legroom, which puts it in league with some much larger sedans, the Corolla LE model offers some of spacious seating possible along with quality fabric upholstery in a choice of Almond, Ash/Dark Gray or Black/Brown color schemes. Available auto climate control puts comfort at your fingertips. And when you’re not traveling lightly, available 60/40 split rear seats allow more room for added cargo. The new 2018 Corolla XLE and XSE packages feature EntuneTM Audio Plus with Integrated Navigation and App Suite making your drive easier with its 7-in. touch-screen display, backup camera, and Integrated Navigation. Thanks to fully-loaded safety features like Toyota’s new Safety SenseTM system (TSS-P), which includes a Pre-Collision System with Pedestrian Detection that assists in warning the driver of potential dangers. Also included are automatic high beams, a lane departure alert system as well as dynamic radar cruise control. In addition to the new TSS-P system, the Corolla comes standard, the Toyota Star Safety System, which includes vehicle stability control, traction control, anti-lock braking system, electronic brake-force distribution, and brake assist. Top this off with dual stage airbags for both driver and passenger as well as passenger seat cushion airbags, the smart stop technology brake-override system and an electronic tire pressure monitoring system and you have one of Toyota’s securest sedans available. Thanks to its advanced Continuously Variable Transmission with intelligence Shift (CVTi-S), which is programmed to respond more like a conventional geared automatic using discrete stepped shift points for acceleration and deceleration, the 2018 Toyota Corolla offers lower fuel consumption than in the past. Special low rolling resistance 195/65R15 tires also help to reduce fuel usage no matter on roads or highways up to 28/32 (City/Hwy). An ECO Indicator also helps optimize efficiency up to 40 hwy mpg and minimize emissions, all while producing 140 hp. Are you ready to own the newest, Toyota Corolla? Visit Hometown Toyota Scion and schedule a test drive today!